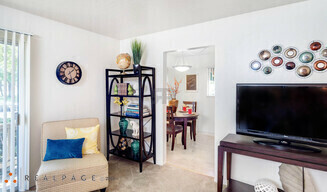 Welcome to Parkside Apartments in Davis CA! Check us out NOW! Come see our beautiful new exterior renovation & we offer ultra-fast AT&T fiber internet with 1000 Mbps connection! We are now accepting dogs. Nestled on 13 acres of park style grounds, Parkside Apartments invites you to join your friends at one of the many social activities offered in our Community Clubhouse or enjoy the flat screen TV. You can also get in shape in the fully equipped Fitness Center with elliptical and treadmills. After the workout, come cool off in our sparkling over sized swimming pool, or simply unwind in the 14 foot spa. Parkside Apartments is located in Central Davis, directly across from the beautiful Community Park and conveniently situated between several shopping centers. A few blocks south is downtown Davis, which offers a wide assortment of shopping and entertainment. Bus stops for the "Commuter"42A and University Transit System bus P,Q & E are directly in front of Parkside. U.C. Davis is approximately 1.5 miles from Parkside. Renter's insurance is required. Residents pay all utilities. Water, Garbage and sewer are billed in addition to rent. PRICES CHANGE DAILY.